In Incurable Me, a maverick physician brings transparency to some of medicine’s most closely guarded secrets. As he establishes a link between commerce and medical research, K. P. Stoller also explains how to treat some of the most worrisome diseases and conditions afflicting humans today—including Lyme disease, brain trauma, dementia, and autism. Dr. Stoller maintains that the best evidence in medical research is not incorporated into clinical practice unless the medical cartel has the potential to make large amounts of money promoting the results of the research. Stoller takes his provocative argument a step further, maintaining that if specific research conflicts with a powerful entity’s financial interests, the likely result will be an effort to suppress or distort the results. Stoller cites numerous examples, including corporate influence on GMO labeling and public health. Stoller also explores how “revolving-door-employment” between the Centers for Disease Control and large pharmaceutical companies can affect research results—as well as our health. 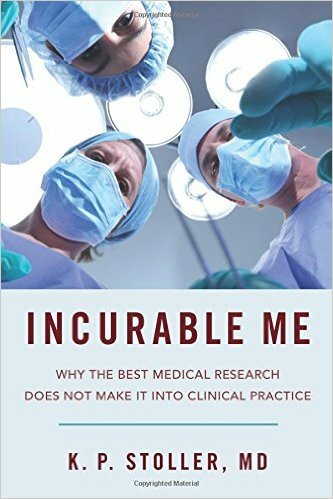 Written in an accessible style that is thoroughly appropriate for a lay audience, Incurable Me is a must-read for anyone interested in the state of modern medicine.